I got 2 new girls recently who's owners were moving and couldn't take them with they came in a small cage that I see at Wal-Mart (I also own 2 from past adoptions) the hamster fun home it's called, i tried to put them in a 10 gallon and they didn't like it they were breathing hard,squeaking,every sound or movement freaked them out, I put them back in the small cage (changed the wheel to something bigger) and they seem content and settled down. I had that cage for a solitary male. That cage is too small for mice, but it’ll do until you figure out what you’d like to do. A tank is perfectly safe and can be LOADS of fun... sounds like your mice were being drama queens. If you’d rather have them in a cage, Amazon has a couple that are a good size for $50-100 or you could buy a cage meant for a larger animal and cover it in mesh so no one can escape. Something like this. This page discusses different types of housing, and has some great examples of different tank-style setups. There’s also some links to cages under the Wire Cages header. 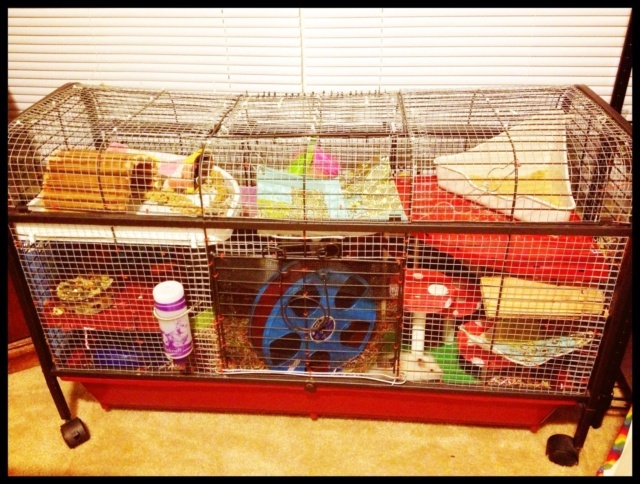 @Peachy wrote: I had that cage for a solitary male. That cage is too small for mice, but it’ll do until you figure out what you’d like to do. A tank is perfectly safe and can be LOADS of fun... sounds like your mice were being drama queens.